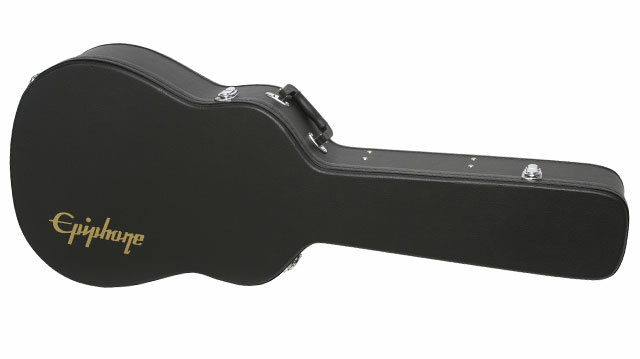 Epiphone presents the new AJ-210CE Acoustic/Electric Outfit, a superb professional dreadnought guitar featuring a Select Spruce top with classic cutaway, state of the art Shadow Performer Tuner HD™ Preamp and NanoFlex™ under saddle pickup system, plus a hard case. Dreadnought acoustic guitars like the AJ-210CE are renowned for their commanding volume and full tone that’s perfect for singer songwriters or for leading a band. And like every Epiphone, the AJ-210CE comes with Epiphone’s Limited Lifetime Guarantee. The AJ-210CE has a Select Spruce top with 5-ply black and white binding and a graceful cutaway for easy access to the upper frets. Spruce is classic tone wood for powerful acoustic guitars and will mellow with age and playing time to reveal a distinctive character. The more you play the AJ-210CE, the better it will sound. The body is made from Select Mahogany and the neck is made from Okoume with a SlimTaper™ easy-to-play “D” profile that is glued to the body with a classic dovetail joint. The neck features 20 medium frets, a standard 25.5” scale, and a fingerboard with pearloid “Dot” inlays. 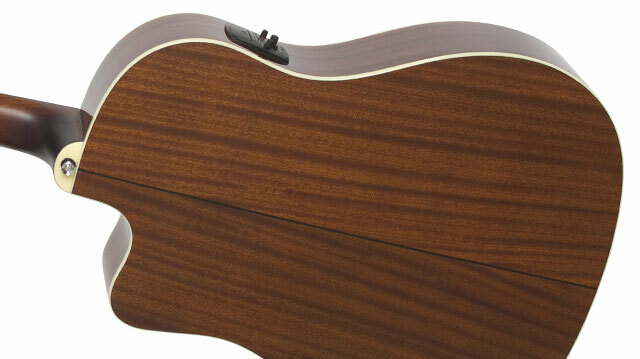 The AJ-210CE has a “reverse belly” bridge and an Epiphone styled imitation tortoise pickguard with a metal "E" logo as seen on vintage Epiphone acoustics like the Texan and Caballero. The AJ-210CE is available in Natural and Vintage Sunburst color finishes. When you’re ready to plug in, the AJ-210CE features Shadow Performer Tuner HD™ Preamp and Shadow NanoFlex HD™ under saddle pickup system. Shadow is the world leader in acoustic guitar electronics. Now you can hear the true sound of your guitar on any size stage. The Shadow Performer Tuner™ preamp features all the controls you need to tailor the sounds of your AJ-210CE to suit your playing style, volume level, and venue size. 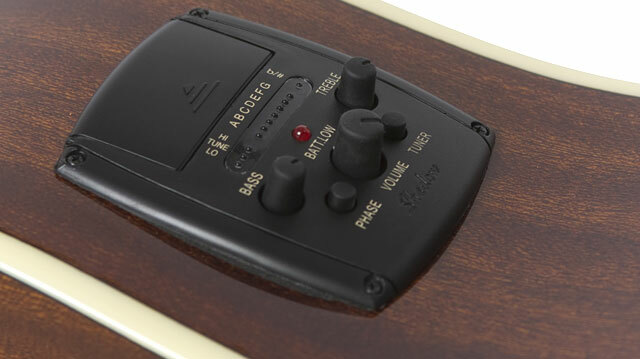 Pro features include a built-in Chromatic Tuner, Master Volume, EQ controls for Bass and Treble, a Low Battery indicator, and a Phase switch to help eliminate unwanted feedback. 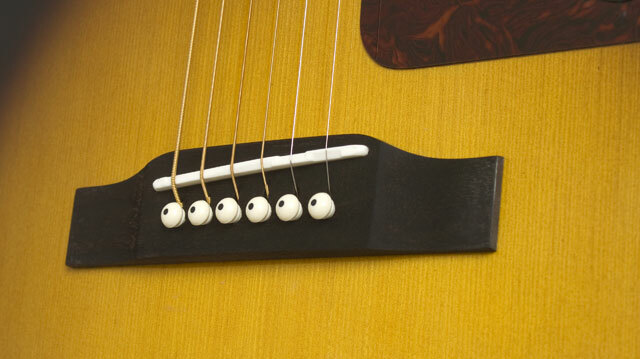 A handy Tuner/Mute button allows you to plug or unplug your guitar silently. The Performer Tuner HD™ preamp uses two AAA batteries that are lightweight and provide significantly longer life than heavy 9-volt batteries. Under the AJ-210CE's compensated saddle is Shadow's proprietary NanoFlex HD™ low-impedance pickup. Unlike a harsh sounding piezo pickups, the NanoFlex’s™ unique and flexible sensing material features integrated active electronics that pick up not only string vibrations but also top and body vibrations as well for a truly acoustic tone. The AJ-210CE comes with Epiphone’s Premium Die-Cast machine heads with classic styled kidney buttons and a tuning 14:1 ratio for fast and accurate tuning. Strap buttons are pre-installed and the AJ-210CE is set up at the factory with legendary D'Addario Phosphor (12-53) strings. Plus an Epiphone hard case is included! 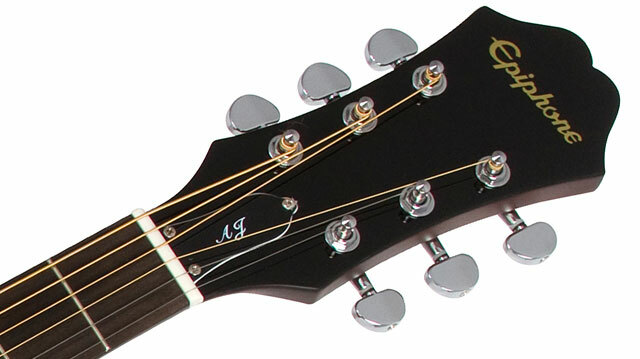 Like all Epiphones, the AJ-210CE comes with a Limited Lifetime Warranty plus Gibson 24/7/365 Customer Service. Visit your Authorized Epiphone Dealer today or visit Epiphone.com to find an Authorized Dealer near you.